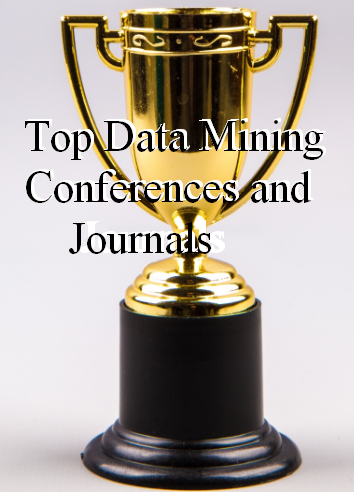 A key question for data mining and data science researchers is to know what are the top journals and conferences in the field, since it is always best to publish in the most popular journals or conferences. In this blog post, I will look at four different rankings of data mining journals and conferences based on different criteria, and discuss these rankings. It shows that some conferences in the field of data mining actually have a higher impact than some journals. For example, the well-known KDD conference is ranked higher than all journals. It appears strange that the KAIS journal is ranked higher than DMKD/DAMI and the TKDD journals, which are often regarded as better journals than KAIS. However, it may be that the field is evolving, and that KAIS has really improved over the years. Another automatically generated ranking is the Microsoft ranking of data mining conferences (http://academic.research.microsoft.com/RankList?entitytype=3&topdomainid=2&subdomainid=7&orderby=1). This ranking is based on the number of publications and citations. Contrarily to Google, Microsoft has separated rankings for conferences and journals. Besides, Microsoft offers two metrics for ranking : the number of citations and the Field Rating. It is not very clear how the “field rating” is calculated by Microsoft. The Microsoft help center describes it as follows: “The Field Rating is similar to h-index in that it calculates the number of publications by an author and the distribution of citations to the publications. Field rating only calculates publications and citations within a specific field and shows the impact of the scholar or journal within that specific field“. The ranking by citations and by field rating are quite similar. PKDD is higher than PAKDD, which are higher than DASFAA and DAWAK as in the Google ranking, and I agree with this. Some conferences were not in the Google ranking like ICDE. It may be because the Google ranking put the ICDE conference in a different category. Microsoft rank DMKD / DAMI as a conference, while it is a journal. The FIMI workshop is also ranked high although that workshops only occurred in 2003 and 2004. Thus, it seems that Microsoft has no restrictions on time. Actually, since the FIMI workshop was not help since 2004, it should not be in this ranking. The ranking would probably be better if Microsoft would consider only the last five years for example. Now let’s look at the top 20 data mining journals according to Microsoft, by citations. And here is the top 20 journals by Field Rating. The ranking by citations and field rating are quite similar. The TKDE journal is again in the top of the ranking, just like in the Google ranking. It make sense that the VLDB journal is quite high. This journal was not in the Google ranking probably because it is more a database journal than a data mining journal. Sigkdd explorations is also a good journals, and it make sense to be in the list. However, I’m not sure that it should be higher than TKDD and DMKD / DAMI. The KAIS journal is still ranked quite high. This time it is lower than DMKD / DAMI (unlike in the Google Ranking) but still higher than TKDD. This is quite strange. Actually, TKDD is arguably a better journal. As explained in the comment section of this blog post, a reason why KAIS is ranked so high may be because in the past, the journal has encouraged authors to cite papers from the KAIS journal. Besides, it appears that the Microsoft ranking has no restriction on time (it does not consider only the last five years for example). It is also quite strange that “Intelligent Data Analysis” is ranked higher than TKDD. Some journals like WWW and JECR should perhaps not be in this ranking. Although they publish data mining papers, they do not exclusively focus on data mining. And this is probably the reason why they are not in the Google ranking. On overall, the Microsoft ranking seems to be broader than the Google ranking. As in the Microsoft ranking, DAMI/DMKD is above KAIS, which is above TKDD. As pointed out in the comment section of this blog post, it is strange that KAIS is so high, compared for example to TKDD, or VLDB, which is a first-tier database journal. This shows that IF is not a perfect metric. Compared to the Microsoft Ranking, the IF ranking at least has the “Intelligent Data Analysis” journal much lower than TKDD. This make sense, as TKDD is a better journal. In this blog post, we have looked at three different rankings of data mining journals and conferences: the Microsoft ranking, the Google ranking, and the Impact Factor ranking. All these rankings are not perfect. They are somewhat accurate but they may not always correspond to the actual reputation in the data mining field. The Google ranking is more focused on the data mining field, while the Microsoft ranking is perhaps too broad, and seems to have no restriction on time. Also, as it can be seen by observing these rankings, different measures yield different rankings. However, there are still some clear trends in these ranking such as TKDE being ranked as one of the top journal and KDD as the top conference in all rankings. The top journals and conferences are more or less the same in each ranking. But there are also some strange ranks such as KAIS and Intelligent Data Analysis being ranked higher than TKDD in the Microsoft ranking. Do you agree with these rankings? Please leave your comments below! Update 2016-07-19: I have updated the blog post based on the insightful comments made by Jefrey in the comment section. Thanks! H5 (the Google measure) is not useful to assess the average quality of papers, but it is a good proxy for total impact on the field. The reason for this is that H5 does not punish for having very many publications. This kind of information should not be used to determine which journal to submit your paper to. Perhaps you are also aware that KAIS conducted terribly unethical behaviour in the past; they required every publication to cite at least 4-5 papers from the journal, suggesting to authors that had fewer such references that there paper was ‘not sufficiently clearly in the scope of the journal’. They were banned from ISI then, and have since improved their behaviour and were recently indexed again. It depends on how far back the data is included in the scores whether this would still be visible in the numbers above. For #3, the Microsoft Journal ranking, you copied the ‘field ratings’ not the citation counts. I do not know what this field rating means, maybe you could find out? The most recent IFs put DMKD (or DAMI, as it is typically called in the field) just ahead again of TKDE: 2.714 vs. 2.476. My subjective view is that they are both top-tier, with DAMI slightly ahead in quality. I would put SIGKDD Explorations in the same group as well, but that really includes very few papers per year (10 or even fewer). Apparently TKDE publishes considerably more papers than DAMI, so its total impact on the field is higher, hence its field rating may be appropriate. Subjectively, I would rank TKDD and KAIS simply in tier two, just like IPL, CS&DA, SADM. VLDB is not data mining, but it is absolutely top tier in databases, so its IF is apparently a bad indicator. As you probably know IF includes only citations from venues that are indexed in Thomson Reuters’ Web of Science, which includes only a fraction of computer science publications. The Microsoft and Google data is much better for analysis of computer science publication venues. 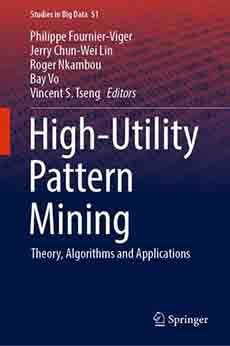 Of course there are computer science journals that also publish data mining that are (much) more prestigious: Pattern Analysis and Machine Intelligence (PAMI), Journal of the ACM (JACM), ACM Computing Surveys (for surveys only of course). Finally, there are occasionally papers in Science and PNAS. Recent evidence: http://science.sciencemag.org/content/353/6295/163. Thanks for taking the time and effort to write this! Thanks a lot for your insightful comments. I have updated the blog post based on your comments. Based on your comments, I have also found that Microsoft has no time restriction in their formula for calculating the ranking. For example, they include the FIMI workshop in their ranking, which was not held since 2004. Thus, I think that it explains the high ranking of KAIS. It would means that they are considering the all-time citations of KAIS rather than just the last few years. I was not aware of the past problems of the KAIS journal with citations. Given your explanation, I think that we have found a plausible explanation for the high ranking of KAIS. By looking again at the ranking, I also found quite unusual that Intelligent Data Analysis is ranked higher than TKDD! IDA is in my opinion a second or third tier journal. It should clearly not be above TKDD. Thanks again for your discussion on this blog. It is quite interesting to read your comments. I agree with you regarding IDA and TKDD. I did not know even that the IDA journal published that many papers (>400 according to Microsoft in your tables). Anyway, the Impact Factor for IDA is 0.631 (2016) while for TKDD it is 1.0 (2015, couldn’t find 2016), which aligns with our impressions. Kindly suggest some good journals without processing/maintenance fee which are completely free, and how much time they will take to publish, as it is very useful for poor full time research scholars doing with less/without fellowship. Also suggest some journals which are good for publishing paper first time. Hi, thanks for writing comments on the blog. To avoid paying fees, you can look at the journals of big publishers such as ACM, IEEE, Elsevier, Springer… Most journals by these publishers are free and are good to excellent journals. Personally, I like the Elsevier journals as the review time is relatively fast usually. If your paper is very good, you can submit to Knowledge based systems or information science. The review time for the first round is usually 2 months for KBS and maybe 4 months for Information Science. But these are top journals. There are also other good Elsevier journals like EAAI, DKe, ESWA… In Springer, Apllied Intelligence is not bad. That is some of my suggestions. Depending on the topic of your paper you can find others. By the way, you can also submit to my journal DSPR : data science and pattern recognition. The review is less (maybe just a few weeks) and it is currently free). If you are interested just let me know. Best regards. Thank you very much sir for your valuable suggestions, It is really appreciable.As my university told us to publish in SCOPUS or higher indexed journal only, but in future I will surely consider your journal and already shared your blog and the your journal details with my friend. Thank you once again, continue the good work and keep guiding us.